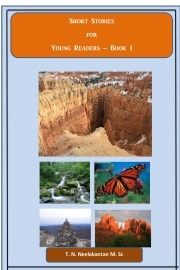 Description of "Short Stories for Young Readers - Book 1 (eBook)"
This book is an anthology of seven short stories written by T N Neelakantan. All the key characters in the stories are children and youth. The situations in the stories bear a lot of Indian-ness, familiar to readers. They are good for conveying significant spiritual and moral messages, besides they are good for pleasure reading too. The book and the stories have been conceived, keeping youth in mind for their benefit. A must read book for young readers! Reviews of "Short Stories for Young Readers - Book 1 (eBook)"